Friday night’s start-studded Imagen Awards, held at the Beverly Wilshire Four Seasons hotel, hosted an array of entertainment’s top-tier talent — from Lin-Manuel Miranda to America Ferrera, and the icon who is Rita Moreno. Winners at last night’s Imagen Awards included multiple wins for the Netflix-original, “One Day at a Time.” Based on Norman Lear’s 1975 hit show by the same name, the show took home the Best Comedy- TV award, Best Young Actor-TV category with actor, Marcel Ruiz, who dedicated his trophy to Puerto Rico, Best Supporting Actress-TV with Isabella Gomez, and Best Actress-TV, Justina Machado. “Queen of the South,” took home Best Primetime TV program. This year the annual Imagen Awards celebrated its 32nd year honoring the talents of Latinos in television and film. A demographic often overlooked by mainstream award shows, the premier event highlights the positive images of Latino culture and Latinos in entertainment. “Everyone is talking about diversity in Hollywood these days – the truth is before casting decisions are made, before agents can submit their diverse clients, diversity begins in the producer’s offices and in the studios,” Rita Moreno said.The Best Director award went to Miguel Arteta for “Beatriz at Dinner,” starring Salma Hayek, who also won Best Actress in a Feature Film for her role in the movie. “Making this movie like this is hard, even with a great star like Salma Hayek to get the funding for a film that has a Latina at the center of it, but once you make it, people will see it. This award goes to all the people who’re fighting, “la lucha,” to get their Latino stories told. Keep fighting,” Arteta said. In addition to the actors, film and TV projects themselves, this year Imagen celebrated the talents of Broadway superstar and ‘Hamilton’ and ‘In the Heights’ creator Lin-Manuel Miranda and his family. They received the Imagen President’s Award for their humanitarian and artistic contributions. President of the Imagen Foundation and co-founder of the Imagen Awards, Helen Hernandez, told NBC Latino the ceremony is an opportunity for the Latino creative community to say to the Miranda family we’re proud of you and welcome to Los Angeles. “The Miranda family’s passion for giving voice to and empowering their larger community is undeniable and often insanely entertaining… Thank you for making are that makes us feel more alive. For embodying a spirit that reminds us we are all at our core creative and full of possibility, and for your commitment to one another and the community. Imagen Foundation honors your family,” America Ferrera said before presenting the Miranda family with their award. “My heart is so full after tonight’s @ImagenAwards. Thanks for honoring our family y nuestra gente, always,” Lin-Manuel posted on his Twitter, after the event. 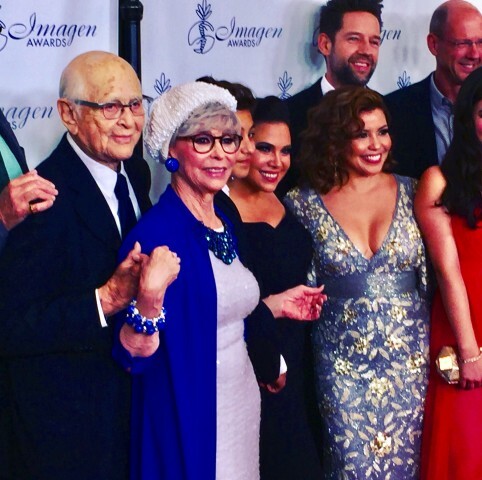 Hernandez, along with acclaimed industry veteran and show creator Norman Lear, first started the Imagen Awards in 1985. “It was a luncheon. We were lucky to get 75 people in the room, and we struggled with who we were going to honor. At that time it was slim to none. Now, 32 years later, we have a process where people submit for the award, similar to the Emmys or Oscars, and we had over 200 submissions this year, in addition to our first ever, online short student films and web series, for the public to vote on,” said Hernandez to NBC News. “We’re very pleased to see where we’ve come in 32 years. It’s been a struggle along the way, but finally we’re turning the corner and seeing the successes of our work over the years, by looking at the last season on TV. The number of actors with lead roles and supporting roles — there’s been a huge difference, especially in the five years,” Hernandez said. Ganem told NBC Latino that although things for Latino actors are changing very slowly, she feels lucky to be in the business today, and excited that there is a movement afoot to push the issue of more Latino representation in Hollywood. Phillips, a kind of honorary Latino after performances in films such as “La Bamba” and “Stand and Deliver,” told NBC News he realizes that over the last couple of decades he’s a member of the vanguard; opening doors and keeping them open is vital to him. “The recognition by the Imagen awards means quite a lot to me. Obviously I’ve represented the Latino community since “La Bamba” and “Stand and Deliver.” Now once again with “Created Equal” and “The 33.” I take that responsibility very seriously and I applaud the fact that the conversation has grown more pointed in the last few years because the status quo has not addressed it,” said Phillips. “I remember when we did “La Bamba” and “Stand and Deliver,” and people were throwing their hands in the air and applauding the new Latino wave of filmmaking, but it never turned into a constant tide. It came and went. And it comes and goes every few years,” Phillips said. In the years Hernandez has worked on both the award show and the foundation, her focus has been on the day, she says, when Imagen won’t be necessary. But today, the relevance and need for the ceremony is obvious. “If you look at the Oscars and Emmys, especially the announcement of the nominees this year, you don’t see any Latino names. How can you discount Rita Moreno and Justina Machado for “One Day at a Time,” or Gina Rodriguez and Andrea Navedo for “Jane the Virgin,” said Hernandez. “Were it not for Imagen our people would go unnoticed. When you look at who’s in the ballroom, it’s not Latinos, it’s executives from HBO, Netflix, CBS, NBC, Disney, so our message is going directly to the industry and saying look at what we are and who we are.” said Hernandez. “We stay positive because we have a lot on our side. We have numbers – we’re the executives of the future. So as a businessperson, it’s only smart to be inclusive in order to be able to program for diverse communities that make up this country,” Hernandez added. Imagen honored NBC Entertainment with the Vision Award for providing opportunities for Latino advancement in the entertainment industry, both in front and behind the camera.